Surrounded by the rolling hills of Silicon Valley, San Jose is considered the largest city in Northern California. Situated near the world’s technological hub, San Jose has earned the nickname, “Capital of Silicon Valley”. It is one of the wealthiest city in North America and the world, having the third highest GDP per capita (only following Zurich, Switzerland and Oslo, Norway). Its food truck scene also has plenty to offer, presenting a diverse selection of local and international delicacies. 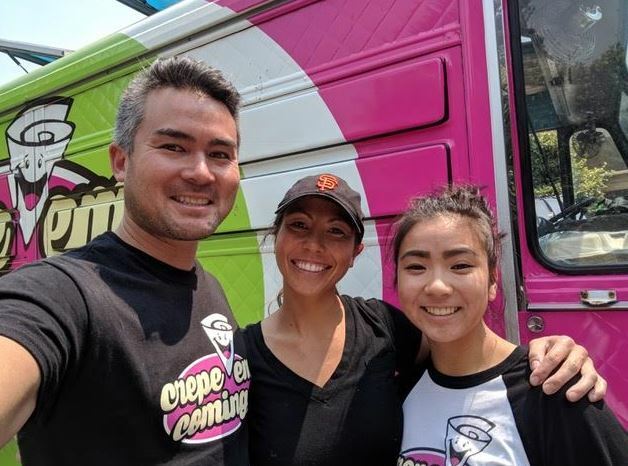 One such food truck which has a lot to offer is Sara and Peter’s Crepe ‘Em Coming operating around the Santa Clara County. Since acquiring from its original owner, Ron Reduta, Sara and Peter have gone a long way in operating the food truck and serving their clients in one of the most food-centric areas in the country. Here’s a piece of what the couple has to say about their venture into the food truck business. FTE: Tell me a bit about yourself, your business, and how long you’ve been operating in your city? Sara: My name is Sara Praegitzer, I’m Idaho born and bred and moved to California in 2012 to go to Culinary School. I have always had a passion for food (I got my undergrad and Master’s degrees in Food Science) and the Bay Area is teeming with opportunities in the food world. I was working as a corporate chef for a sauce company for 5 years here in the Bay Area but I wasn’t doing much cooking. 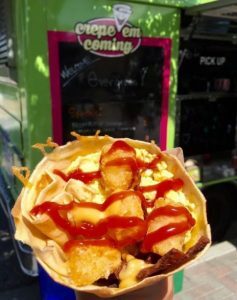 The thought of running a food truck was exciting (as a brick and mortar was WAY out of my price range) and I happened to cross paths with Ron Reduta – the then owner of Crepe ‘Em Coming. We talked and my boyfriend (Peter) and I ended up purchasing his food truck last month. The truck is housed in San Jose and has been operating in Santa Clara County for the past 4 years. Peter and I never thought about going into business together, but owning an operating a food truck in one of the most food-centric areas in the country was an exciting venture we couldn’t pass up. 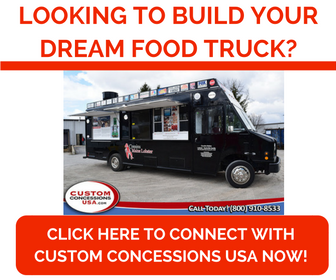 FTE: How did you learn how to start a food truck in your area? Did you read a book, have a mentor, tell us about those early days figuring it all out? Are there any resources you recommend for getting started or organizations that could help entrepreneurs get started in your area? Sara: Ron Reduta (the previous owner) was/is an amazing resource – he was our mentor. I hopped on the truck and worked with Ron one month before he turned the business over to us, so I was able to see the operation from opening to closing and got comfortable operating and driving the truck. The internet is also an amazing resource. When setting up our LLC and getting all of the paperwork for the state and county together, everything is at your fingertips just by Googling “How to start a food truck in California”. However, the food truck community in San Jose is tight. There are no turf wars and we all rely on each other to help when we are in a tight spot. The best resources are the people who are already in the business and everyone is willing to offer advice or let you see the operation first hand. My best piece of advice is to get on a truck and work a couple service and see if it’s what someone really wants to do. Cleaning isn’t glamorous, the days are long and sometimes a bust. Getting a taste of the good and bad is the best starting point, in my opinion. FTE: What are some of the unique challenges of operating a food truck in your city? Sara: I think the most unique challenging aspect of operating a food truck in the Bay Area is brand and cuisine differentiation. There are SO MANY delicious restaurants and food trucks in this area – how are you going to make yourself stand out? It’s difficult to break into this market if you’re just another rice truck, taco truck, pizza truck, or fusion cuisine truck. Also, people in the Bay Area have really distinguished palates, so selling mediocre food is not an option. FTE: One of the most common challenges beginning food truck owners have is navigating city regulations, including health and fire safety requirements. As you know these regulations vary considerably from county to county and city to city. Where should entrepreneurs go to find information about the local health code and fire safety regulations? Sara: To serve the general public, the food truck (or mobile food facility (MFF)) must have a county health permit. To get information on the requirements for health permits, simply search for Mobile Food Facility Health Permit Checklist in the county of your choice. For fire safety, it is a bit more standardized, but visit the local fire department website to see the requirements for Mobile Food Facilities. FTE: What do you love about being a food truck owner in your city? Sara: What’s not to love? I get to feed people good food which brings me such great joy! I get to interact with others and help make their events (birthday parties, weddings, social events) fun and successful. I get to work with an amazing network of other food truck operators. I get to be my own boss and make my own schedule. And I do all of this and make money. It’s pretty sweet! FTE: Finally, if you could give only one piece of advice for new food truck entrepreneurs. What would that nugget of advice be? Sara: Be ready to work… HARD. Some days are easy, but it’s not just about operating the truck. You have to maintain the truck, prep, cook, serve, clean, answer e-mails, keep up with social media and take care of yourself. It’s not easy, but it’s hugely rewarding! Food Truck Average Income – A survey of over 300 food trucks around the country. 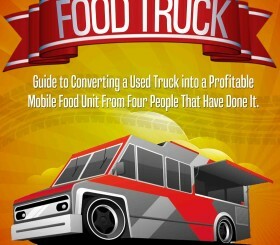 Learn as they share their annual revenue in operating a food truck. City of San Jose – Learn the city’s regulations in putting up your own business. Best Food Trucks – Get to know what the city of San Jose has to offer in the food truck business. Mobile Food Facility Checklist – Get information on what to prepare when applying for a health permit in Santa Clara County.